The Tuaregs are monogamous and they are more attached to their ancestral traditions through the strengthening of the social ties whose marriage is considered as the most sacred. The marriage rituals still preserved and transmitted from generation to generation .In the traditional Tuareg marriages, in many cases, when an agreement is done between man and woman, the man then delegates an elderly people of his family to ask for the hand of the girl .The rapprochement between the two families is established to find a common ground for weaving a new tribal bond , fix the amount of the dowry and discuss the conditions for preparing and organizing the ceremony ,of course, under the approval of the tribe’s chief . Generally, the dowry is fixed in kind of animals (camels, goats or oxen) or in cash. Some or the entire dowry is paid to the girl's parents. This ceremony is officialized by a sheikh (a person who is educated in Islam). After this stage, a date is chosen to celebrate the marriage. The Tuareg wedding ceremonies last for a week where songs and dances are performed to the rhythm of the Tindi and Imzad (musical instruments).The ceremony is animated by a large number of women and men dressed their finest garments. The bride is made up with products from a local makeup and adorned with silver jewelry and colorful dress. As usual, the meal Talebdjat is served to the guests consists of chopped camel meat, followed by tea prepared by the fire of embers and the distribution of another dish consisting of an extract of dates and milk. In addition to the dishes, there is the sacrifice of goats that are proposed during the seven days of celebration. Among other traditions, the groom will have to give to his wife a pair of real leather shoes called Agatimene as well as a symbolic sum of money. The tent and its furnishings are supplied to the couple by the bride's family. The latter keeps the property in case of divorce. Moreover, their children bear their mother’s family name and not of the father. There is a very expressive and impressive proverb in the Tuareg society; "woman is the belt of man's trousers", or "woman is man's pants" which shows the importance of the reference to the attire as a representation of the female and male roles. Without a belt, the pants fall and without pants a man is dishonored. Woman, like trousers, protects man from shame. Like the belt, it maintains honor, it is honor and man is its representative. The most important selection criteria of the Tuareg men for their spouses is based on above all its beauty as well as its capacity to guarantee appearances, namely to respect the game of tradition. 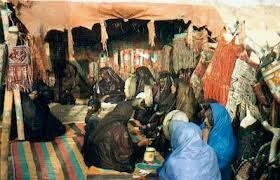 The marriage, in Tuareg, allows an individual to determine his place in the community. In a nomadic environment, from adolescence, the boy leaves the tent of his mother. The tents are female possessions and the most commonly used expression in Adagh and Gourma to mean that one married "to make one's tent". By marrying, the man reinvests a tent (that of his wife) and thus finds stability and recognition in society. The tent is an extension of the mother's tent that transmits to her daughter elements of her own tent. During a divorce, the woman takes away her tent and the man, again homeless, no longer has any social status.